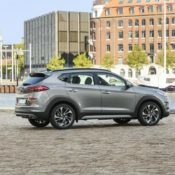 The European customers of the new 2018 Hyundai Tucson facelift can now order this affordable SUV with an efficient mild hybrid diesel powertrain. The system consists of a 2.0 liter and a 48-volt battery that assists the combustion unit and makes its operation more economical. To be more precise and technical, the mild hybrid system in the new Hyundai Tucson features a 0.44 kW/h 48-volt lithium-ion battery, a Mild Hybrid Starter Generator (MHSG), a LDC converter (Low Voltage DC/DC) and an inverter. The system switches automatically between mechanical use of the engine and energy recuperation to achieve the best compromise between performance and fuel saving. 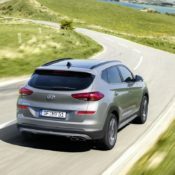 With a total output of 186 horsepower, this four-wheel-drive version of the Tucson is quite possibly the most capable edition of the car released to date. You can have your mild hybrid Hyundai Tucson with either a six-speed manual gearbox or an 8-speed automatic. The former is more efficient, cutting fuel consumption and CO2 emissions by 7 percent compared to normal powertrians, but the latter is more convenient. But even if this system is still not eco-minded enough for you, next year Hyundai will release a mild hybrid version of the new Smart Stream 1.6-litre diesel engine. 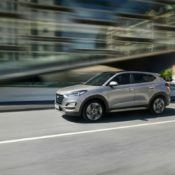 The post New Hyundai Tuscon Gets 48 V Mild Hybrid Powerrain appeared first on Motorward.